Well, I feel like I haven’t posted anything showcasing productivity lately, so in response to that, I snapped this picture of what I worked on this afternoon. I have mentioned before that I am working on two kitchen islands. One is a custom order and the other one I will take to the next Stylish Patina barn sale. 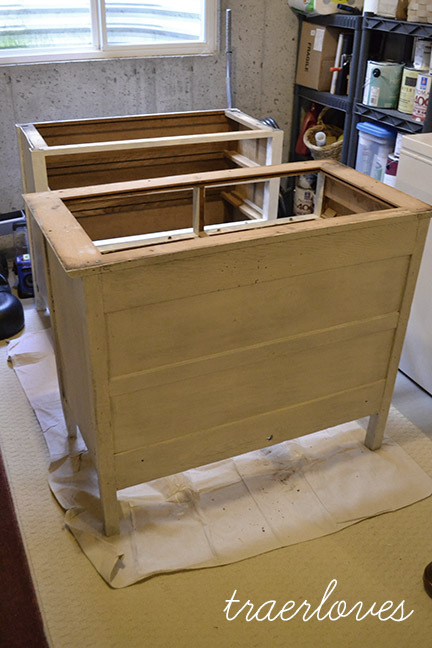 It has been an interesting and long process to turn these little ladies into kitchen furniture. I am very excited to see how they turn out. But in almost all the projects I work on, there is an ugly stage. That is what these two are currently in. They both need a couple more coats of paint, their new brackets, and then finished off with spiffy new tops. But until then they will remain ugly. Which got me thinking about my own life, and how God has worked in it. There have been countless times when I felt things were ugly, and I just couldn’t see how God was going to work it all out. But then things were slowly added in my life, reshaped, reformed, and I could see all of the wonderful things God was placing and constructing around and in me. Have you ever felt this way? I am sure most of us have. But the thing I have come to realize, is that there will always be ugly stages, situations that we can not see any good coming from. But God has an ultimate plan, and will fulfill it in this life and the next. Sometimes I wish God could finish painting that dresser for me, but this girl has to roll up her sleeves and get the dirty work done. Well, deep thoughts from Traer today, so I think I need to unwind and relax a little tonight. I am going to try to hit an auction tonight. I sold half of my inventory at the Stylish Patina January barn sale, so I need to restock! I will post pics if I find anything good. And don’t worry I will take everyone who wants to go to an auction soon. I need to find a big one so we are not all fighting over the good stuff. I hope everyone is having a wonderful week! P.S. Yes, I am painting in my basement, next to a heater, because it is WAY TOO COLD, to paint outside! sooo cold! that’s awesome that you sold lots of your inventory at the sale!! can’t wait to see how the islands turn out. Glad to hear you did well @ the Barn Sale! Can’t wait until February! Thanks Terry! I am excited that a lot of people from the barn with be at Lucketts Fair! And I think that you will like having two spots this year too!